DCRA purchased the fence from the City of Clinton rather than allow it to be sold for scrap or leave DeWitt County. It is being stored by the association so that it can be used in public places throughout the county. 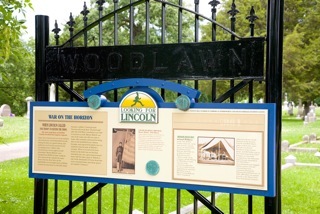 The decorative fence that used to surround Woodlawn Cemetery was donated in 1908, along with the cemetery’s main drive, by Eleanor Magill, widow of Samuel Magill, one of the four brothers who built the Magill House. Mrs. Magill, who lived to be 98 and who had no surviving children, was known for her generosity to the church, local organizations, and needy individuals. Ten sections went to Harp Township in DeWitt County to be used to enclose the rural Wilmore Cemetery. Several sections are being refurbished to enclose an area around the oldest brick residence in Clinton (built in 1859 by Charles Zorger, construction supervisor for the earliest brick buildings on the Clinton square). The building was later added to and became the Central European Hotel and has been renovated for apartments. It is located on East Washington and adjoins the city parking lot across the street from Ace Hardware. Fifteen sections have been set aside for use at the former Roque Club at the corner of West Main and Illini Drive, which is being restored as a public park as a project of the Clinton High School class of 1973. These will separate the park from the adjoining railroad tracks. The Village of DeWitt will use ten sections as part of the landscaping around their Looking for Lincoln display in the center of the village. Additional salvaged sections are being saved for use in other public places in DeWitt County, with the criteria for use being places for public enjoyment of the historic fence.